By D Home | 9 years ago We're going younger with this year's list, picking only houses built after 2003. By Laura Kostelny | 9 years ago Style matters for Garry Cox and Don McDermett’s deluxe apartment in the sky. By D Magazine | 9 years ago These sculptures will keep you ahead in the art game. By Peggy Levinson | 9 years ago Heather and Scott Alexander renovated their Park Cities house. And it's just as nice as they are. By D Magazine | 5 years ago 10 local designers, photographers, and artists explore the city to inform their own work. By Laura Kostelny | 9 years ago We favored newer houses in compiling this year's catalog of residential pulchritude. By Peggy Levinson | 9 years ago Don Mayborn explains why the family picked up stakes and moved. By D Magazine | 9 years ago Short ribs, smoked cheese, and gourmet sausage recommended by Central Market's executive chef. By Peggy Levinson | 9 years ago We love these suspension lamps from Design Within Reach. By Peggy Levinson | 9 years ago This Dallas tastemaker saves us a seat at her table. Is This Lamp Crazy or Cool? By D Magazine | 9 years ago Ice Lite floor lamp from Fendi Case: artfully over-the-top or fit only for the scrap heap? By Peggy Levinson | 9 years ago There aren't any shrinking violets in this bunch. By Candy Evans | 9 years ago Doctors' secrets, about this area near UT Southwestern, revealed. By Kellyn Curtis | 9 years ago This downtown McKinney shop offers vintage furniture and gourmet flavors. By Peggy Levinson | 9 years ago Enlarge any image to take the place of that boring wallpaper. By Candy Evans | 9 years ago It's a great launching pad for executives constantly on the go. By Jaime Laubhan-Oliver | 9 years ago D Home's art director and photographer set course for West Texas. They came, they browsed, they conquered. By Peggy Levinson | 9 years ago Fall is the best time to enjoy outdoor living in Dallas. 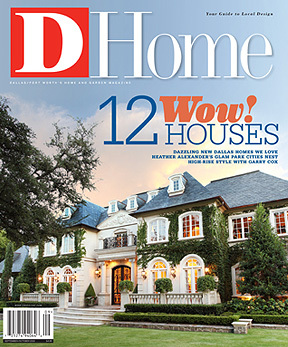 By Candy Evans | 9 years ago Land a big house in Highland Park, Uptown, or Preston Hollow. By Candy Evans | 9 years ago You could call Kessler Park, Lochwood Meadows, or Glenwood Estates home. By Candy Evans | 9 years ago Get a mid-century modern in Jan-Mar, a Bud Oglesby townhouse in Uptown, or a three-bedroom in Little Forest Hills. Why Does Dallas Need Palm Trees? By Christine Allison | 9 years ago Let's keep our fair city from transforming into a miniature golf course.